There are many days of the year that I’m thankful for taking “Student Chef” — one of the home economics courses at my high school. While there may have been a few epic fails in team cooking (ask my friends about why I no longer eat peanut butter cookies), I came away with a few basic ideas about how to cook and some starters for recipes. This lasagna has morphed from our high school recipe over the past 12 years I’ve been making it. The recipe below includes some of my favorite veggies and browned up hamburger. Mix and match to please your tastebuds! The proportions below will give you a 9×13 version; cut in half if you want a smaller square lasagna. This recipe also works really well if you need something prepared in advance. Simply freeze it prior to baking. When you need it, thaw and bake away! Preheat the oven to 350. Set a 9×13 baking pan on a cookie sheet with a lip; this will help keep your oven clean, if your sauce bubbles over during the baking. Cover the bottom of the baking pan with sauce (roughly 4 c). Line the pan with about 6 lasagna noodles; this should be enough to go end-to-end and side-to-side, but depending on how much overlap you allow, you may need a few more or less. I sometime break apart a piece as well to get all the way into the corners. In a small mixing bowl, combine the ricotta and eggs with the salt, pepper, garlic, red pepper flakes, oregano and basil. Whip it with a fork until light and fluffy. Top the noodles in the pan with half of the ricotta mixture. Spread evenly. Add enough yellow squash and zucchini to form an even layer on top of the ricotta. Sprinkle with 1 c of the mozzarella cheese. Top the cheese-veggie layer with more sauce until covered, roughly 4 c. You can use the sauce to fill in the edges as well. Add another layer of 6 lasagna noodles. I try to alternate the directions of the noodles. For example, if my first layer went short side to short side, my second layer would be along the long side. Top the noodles with the second half of the ricotta mixture. Cover with the ground beef and the sliced mushrooms. Sprinkle the second cup of shredded mozzarella cheese over the beef and mushrooms. Add your third layer of noodles. 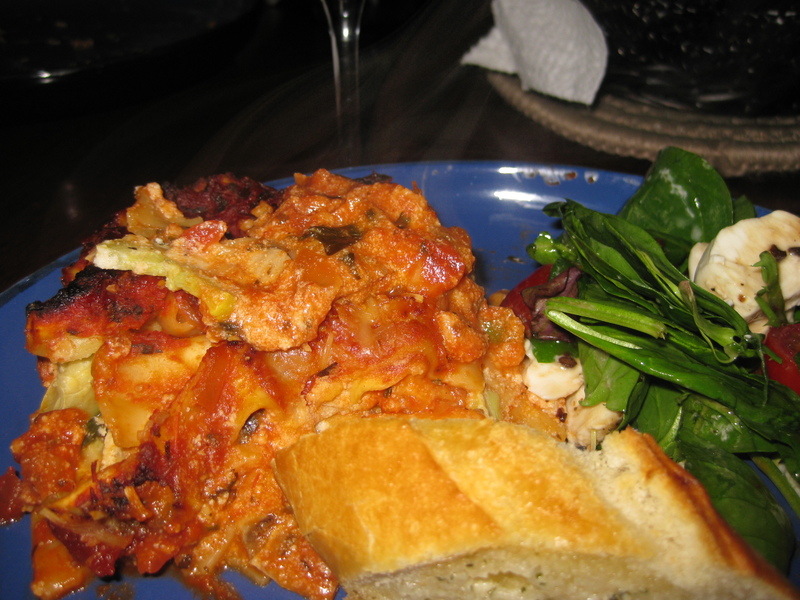 Cover with the last of the sauce until the edges seem “sealed” and there is some on top of the whole lasagna. Bake about 50 minutes to an hour, or until bubbly and just turning crispy. This year I am sadly not hosting Thanksgiving dinner at my house. Instead I will be hopping on a 6:00 a.m. flight to the midwest for some family time. 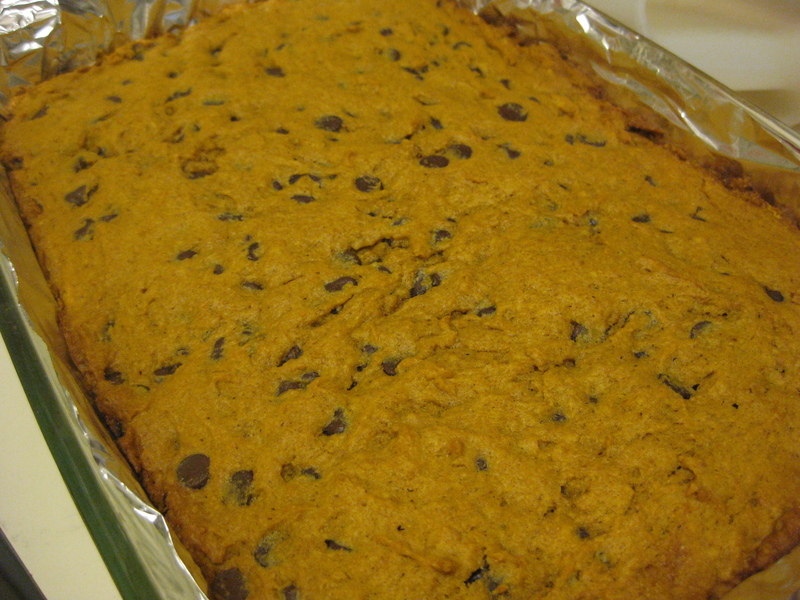 Because I’m flying, I opted to pack up some Thanksgiving-inspired cookie bars. You could make these as traditional cookies, but they are fun as little bites too! Preheat the oven to 350. Line a 9×13 baking dish with foil and lightly grease with nonstick spray. Beat in the egg, pumpkin puree and the extracts. Stir in the salt, nutmeg, cinnamon, ginger, cloves and cardamom. Mix in the flours just until combined. Spread batter in the prepared pan. Bake until fluffy and golden brown, about 40 minutes. Cool on a rack before cutting into squares for serving. 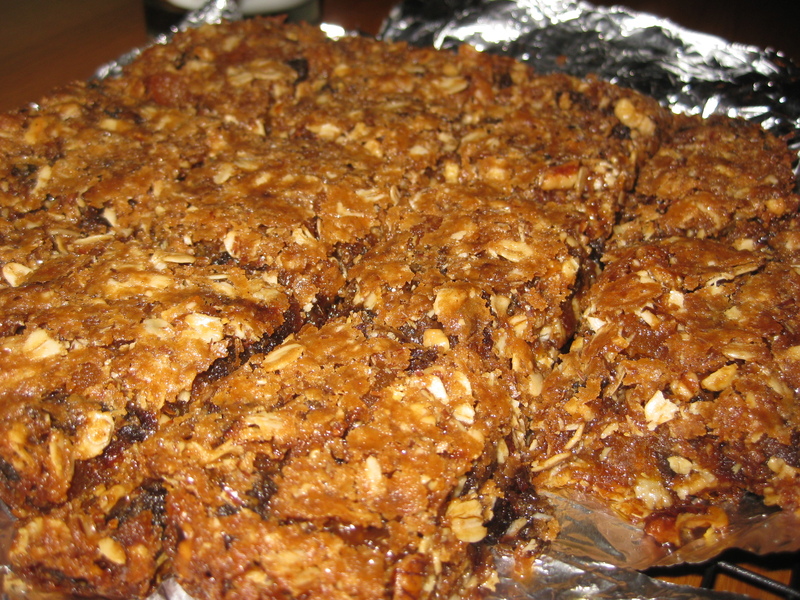 These chewy, fruity bars are a great mid-afternoon snack full of energy. They will set as they cool so don’t worry if they seem a little soft right out of the oven. I used chopped dried apricots and plums, but you can mix in whatever dried fruits make your mouth water. Try them with raisins, cherries, figs and more! If you are feeling adventurous, consider adding in a little crystallized ginger too! Preheat the oven to 350. Line a 9×9 baking pan with foil and lightly spray with nonstick spray. In a bowl, mix together the fruit, oats, flour, brown sugar, nuts, salt, cinnamon, nutmeg and ginger. Stir in the melted butter and the extracts. (Note: if the mixture seems dry and crumbly, add in extra margarine or a little water just until it starts to hold a dough shape). Press the mixture into your greased pan and spread evenly. Bake until golden about 40 to 45 minutes. Everyone needs friends like I have. 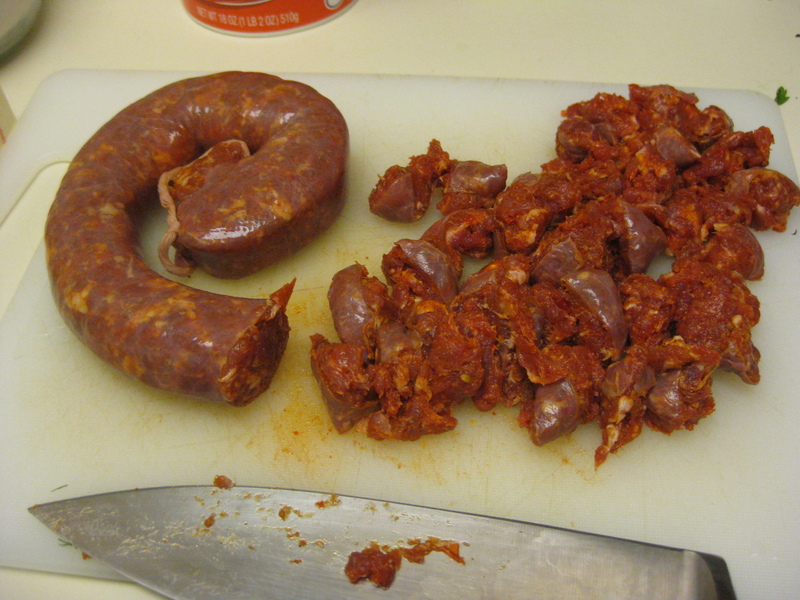 Especially when they include a friend with a dad who cures his own Italian sausage every winter. It really turned this minestrone soup into a mines-“tony” soup. If you don’t have any homemade hot sausage in your freezer, just pick up your favorite sausage from the store! This is a hearty soup that freezes well. Makes about 12 cups. In a skillet, brown the sausage. Put to the side. In a large stock pot, heat the olive oil. Add the bacon and cook until crispy. In a small bowl, combine the rosemary, basil and parsley. Chop using kitchen shears. Add the onions, carrot, celery, cabbage, garlic, rosemary, basil, and parsley to the bacon. Cook while stirring until the greens start to wilt down, about 7 minutes. Stir in the tomatoes. Cook another 3-5 minutes. Stir in the beans, stock and salt. Bring to a boil; then reduce heat and simmer, partly covered, about 30 minutes. Mix in the elbows and the cooked sausage. Simmer for another 15 minutes. 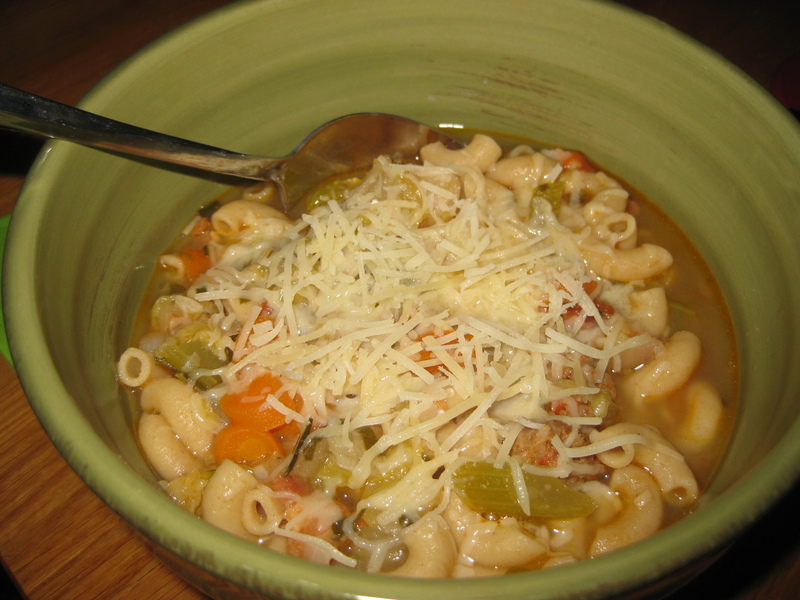 Serve topped with grated cheese (Parmesan or Italian blend). 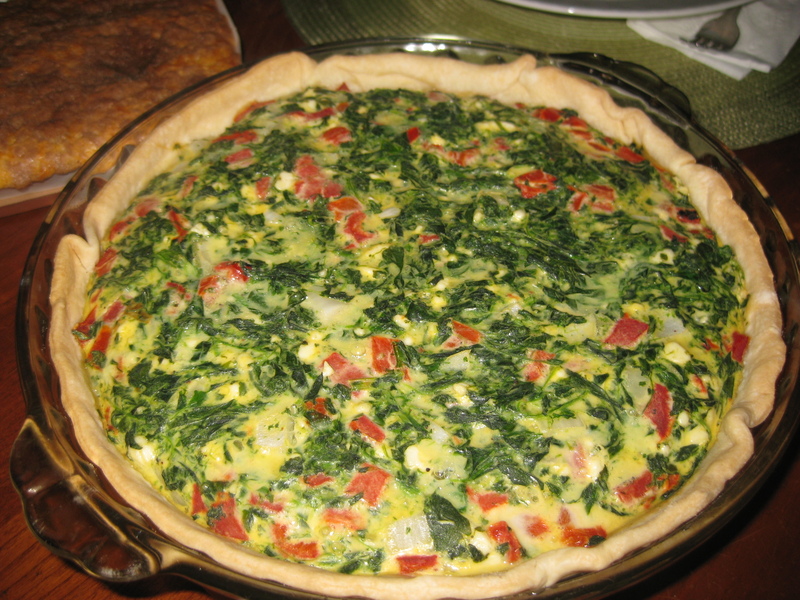 This is a quick-to-whip-up, light quiche that my parents fell in love with during my last visit home. It’s full of chopped spinach, roasted red peppers, and some feta cheese for oomph. We made it with an egg substitute, but you could always use 4 eggs instead. Just whisk them up before added to the veggie mixture. When baking, you want to bake until golden brown with a center that does not jiggle. Then you know it has cooked through! Line pie plate with the pie crust. In a bowl, stir together the spinach, peppers, onion, and spices. Mix in the egg. Bake about 45-60 minutes until golden and set in the middle. Heat oven to 325. Grease your square pan, line with tin foil, and grease again. 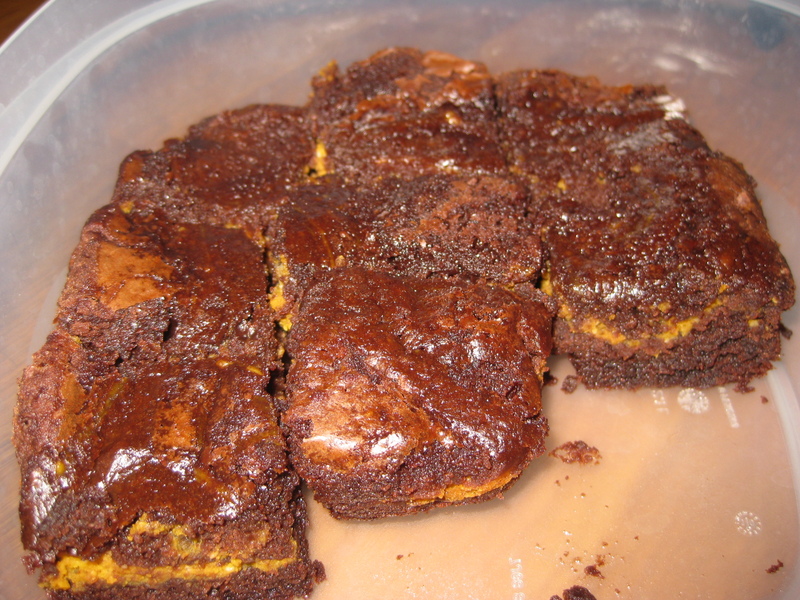 This will make it easy to remove the brownie bars from the pan. Whisk together the cream cheese, pumpkin, egg, sugar, cinnamon and nutmeg till all of the pumpkin cheesecake mixture is smooth. Set aside. Prepare your brownie batter according to your favorite recipe or box; stir in the allspice. Spread 3/4 of the brownie batter in your pan. Drop the pumpkin cheesecake on top by the spoonful. Spoon the remain brownie batter over the filling. Use a knife to marble the batters. Bake 45-50 minute or until just setting in the middle. Cool completely before cutting. Store covered in the fridge! This is seriously simple. This is seriously tasty. You will LOVE it. It’s a great way to use up leftover apples from that trip to the orchard or a bag from the market that was on sale…or even the random apples left in your fruit drawer. I made mine in my crockpot, but you can also use a heavy pot with a lid and cook the apples over low heat on the stovetop. In the end, you should have about 3 cups of sauce. Peel, core and quarter the apples. Place them in the crockpot and sprinkle with the lemon juice. Cook, covered, on low heat for 5 to 6 hours. 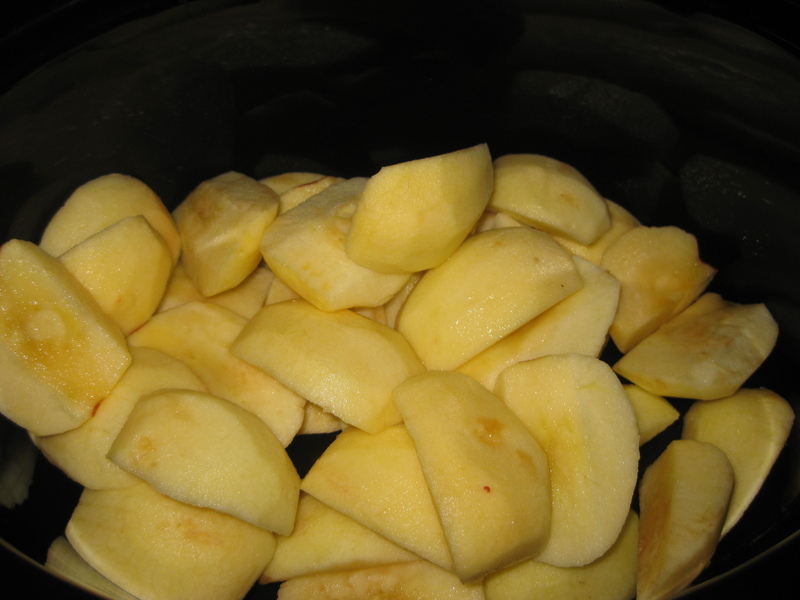 The apples will become fall apart tender and slightly caramelized. You usually won’t even have to break them up at all with a wooden spoon; although you could to speed them up a bit. If you don’t want cinnamon sauce, stop! Your sauce is finished, unless you decide to blend it into smooth applesauce. If you want cinnamon delish, then add in a cinnamon stick about an hour before your want to stop. Remove before serving. 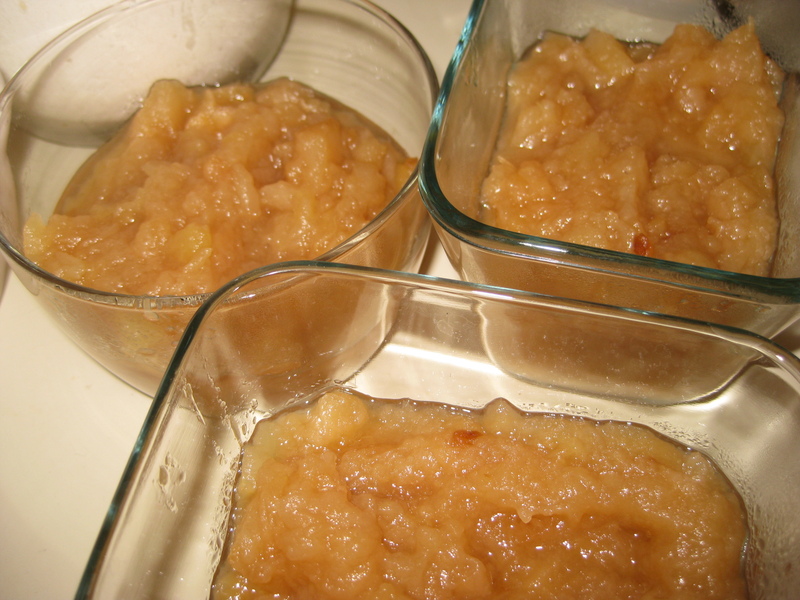 Note: the applesauce will keep for about 2 weeks in the fridge. You are currently browsing the Muffin Bites blog archives for November, 2010.